Thank you for visiting. If you cannot be here in person, enjoy perusing the images below courtesy of Adam & Sarah Mullins of Adam Mullins Photography. The pocket doors separating these two rooms were usually closed and the family did most of its living in the Music Room. In the winter, virtually all activities save for sleeping were conducted in this room in order to save on heating costs (the house's fireplaces are built to accommodate the burning of coal). Only when there was a dinner or a dance were the doors opened to make the best use of the space. The mantels in the house are all different, and were chosen by Mary Anna from a pattern book instead of being made locally. It is interesting to note how the grandeur of the mantels is in proportion to the formality of the rooms, so that as we go to the upstairs bedrooms they become much simpler. While the fireplaces were used to heat the rooms in the house in cooler months, the transoms above the doors were used to cool the house. The front and back doors could be opened alongwith these transoms to aid with cross ventilation. This is the Master Bedroom, or Chamber, of the Avoca Mansion. Modern sentiments and notions of privacy dictate that bedrooms be removed from public rooms and that bedroom doors should remain shut. Beginning in the Colonial Era, the bedroom was considered a public space. Often the most expensive piece of furniture in the house was the bed. Visitors were received “in bed” meaning in the bedroom. By the Victorian Era, guests were no longer entertained in the chamber, although it was still considered a public area. During events, the chamber doors would be left open and it was acceptable for guests to enter the chamber to chat or get away from the crowd in the parlor. The interpretation of this room reflects the tastes of country Victorian families in general and of the Fauntleroy family in particular. While the house was furnished with a bathing room upstairs, each bedroom contained a pitcher and basin. Gladys Fauntleroy, the youngest daughter of Thomas and Mary Anna, was the last resident of this room and much of its content reflects her life. A remarkable young lady, Gladys graduated from Randolph-Macon Woman’s College in 1906 where she was a member of the basketball team. She served as a missionary in Japan and was present during the great earthquake in 1923 when she began to aid in relief efforts. The timing of her trip was also due to her grief over the death of her boyfriend. Upon her return, she met and married Lindley Murray Winston, the son of missionaries she knew. They lived in California until his death in 1947. She then returned to Avoca. The woodwork in this room was originally the dark pine seen throughout the house. It was painted sometime after 1950 to “lighten up” the room. Had a Victorian family painted it, a brightly colored paint would have been used to accent the wall coverings as well as to advertise the wealth of the family. The paper on the ceiling is a good example of conspicuous spending. It would not have been out of the ordinary for a room to sport several different patterns of paper. This room once had a bell in the floor that could be pressed to summon servants from the Brick Kitchen to serve the table. Mr. Fauntleroy purportedly liked to play tricks on his guests using prearranged signals to summon a food so that it would show up as soon as he mentioned a need for it. It was said that no one outside of the household figured out his secret. Afternoon tea was often served in this room. Gladys Fauntleroy Winston served neighborhood children orange juice instead. Refreshments were an integral part of any visit. Although the house was built with running water and wired for electricity, Altavista did not have electricity at that time. It would be 12 years before electricity was available in Altavista. According to family history once electricity was available the house was simply connected and everything worked. The house did not originally have an inside kitchen. This is due to the burning of the first two homes. The brick kitchen was used until a modern kitchen was added circa 1930. All four of the upstairs rooms were bedrooms and each was furnished with two double beds. This room belonged to Gladys Fauntleroy and is now interpreted to reflect the life of a young Victorian girl. Children were expected to behave as tiny adults in both manners and dress. Victorian life was centered on adults and children were often largely raised by the domestics or a nanny. Pursuits considered appropriate for girls included playing with dolls or dollhouses, hosting nursery teas for friends, and various craft projects like making paper flowers, decoupage, silk painting, and cutting paper into elaborate designs. This room often housed as many as six to eight girls, as relatives liked to “summer” at Avoca. Summer was a time of great activity at Avoca with guests participating in pickling, preserving, gardening, churning, sewing and all sorts of leisure activities to fill the long days. At night, adults gathered on the front porch while children played croquet in the yard, sang songs or caught fireflies. By September things would quiet down and all the guests would head for home. The Fauntleroy Gallery contains one of the largest collections of projectile points in Virginia. Much of the collection was found locally and was organized by Juliet Fauntleroy, a family member and local school teacher. During the Great Depression, “Miss Juliet” would give her elementary school students a nickel for every arrowhead they would bring her. Most of the artifacts found locally are attributed to either the Saponi, who lived in Central Virginia more than 300 years ago, or to other travelling Native American groups who frequently used the nearby rivers as highways. The gallery also boasts a hands-on exhibit containing grinding stones and tools, bones, and furs from animals historically found in the fields and woodlands near Avoca. The artifacts displayed here range as far back as 12,500 years. For many years, this room was used as a “birthing” room and later become the boys' bedroom. Peering out of the window, one can see the old tree-lined driveway of Avoca. It offers a beautiful view of the main lawn. Interestingly, the front of Avoca is the side that faces away from Main Street. When the house was built in 1901, the road now known as Main Street was just an oxcart path. The main thoroughfare the entered what would later be known as Altavista roughly followed the same route as present-day Clarion Road. Family tradition holds that children would sometimes slip out of the window onto the terrace to spend the night. A large trunk by the window supplied blankets, pillows, and National Geographic magazines. This room was reserved for Avoca’s guests and, according to the family, was always decorated in blue. Though this bed is a reproduction, it is worth noting that among the many scientific discoveries of the Victorian Era (vaccination, pasteurization, etc.) was the realization that fresh, circulating air was healthy. As mentioned before, in earlier times the bed was an expensive and bulky piece of furniture, heavily draped and sometimes closed with wooden shutters or doors. While Victorian fashion still demanded a showy and elegant bed, it was understood that air circulation was important. This bed demonstrates the union of expensive textiles and carpentry with the desire for openness. Today this room is used regularly as a dressing room for brides getting married at Avoca. It is believed the Sue Jackson Visitor Center was built between 1850 and 1860. It housed the Fauntleroy family after the main house was destroyed by fire in 1879. The west side of this building was given to the Dearing family after 1880 and moved to the Otterbourne plantation, approximately 1.5 miles north. The east side remained and was used as a plantation office. In 1900, the main house was again destroyed by fire and the west side, currently housing the Green Level Gallery, was reassembled after being moved from elsewhere on the plantation. It is believed this section of the house was built shortly after the Civil War. After the property was given to the Town of Altavista, the building was restored thanks to the contributions of the Powell Foundation and the John E. and Sue M. Jackson Charitable Trust. This building is a reproduction of the cabin built in the mid-eighteenth century (ca.1755) by Charles and Anna Lynch upon moving to the property. It was the family residence until the late 1700s when Col. Lynch built Green Level on the same site of present day Avoca. The original cabin stood close to the river until it was moved to a field north of the main house (where Abbott Laboratories stands today) to be used as servant housing. Originally built of logs, the Lynch cabin was weather boarded in the 19th century. The only photographs of the cabin are from near the end of its existence. This cabin, made of Pine, dates to the 1880s and once stood near Gladys, in Campbell County. The original cabin would likely have had a wooden roof. The logs are interlocked at the corners with a dovetail cut, preventing them from moving in any direction. The dovetail was the most common form of notching used in Colonial Virginia. Thanks to the generosity of the Powell Foundation, this cabin was moved to Avoca in 2005 and carefully reassembled. 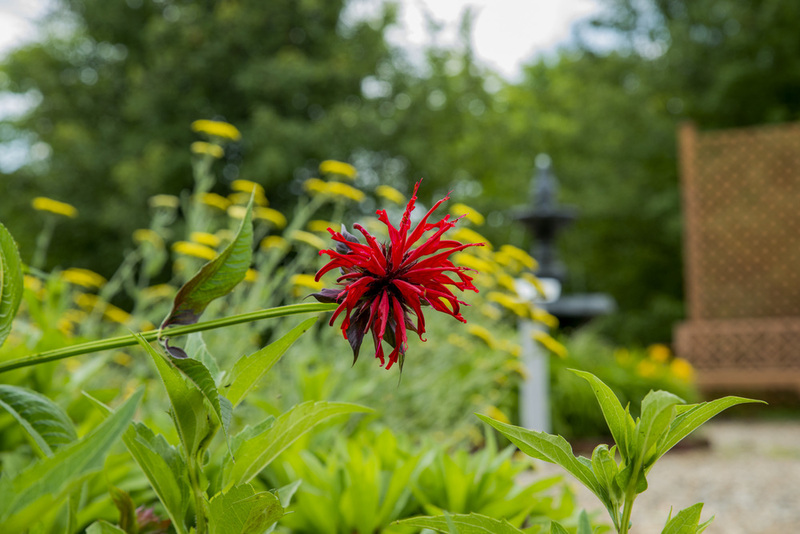 The Dinwiddie Arboretum is open daily during daylight hours. 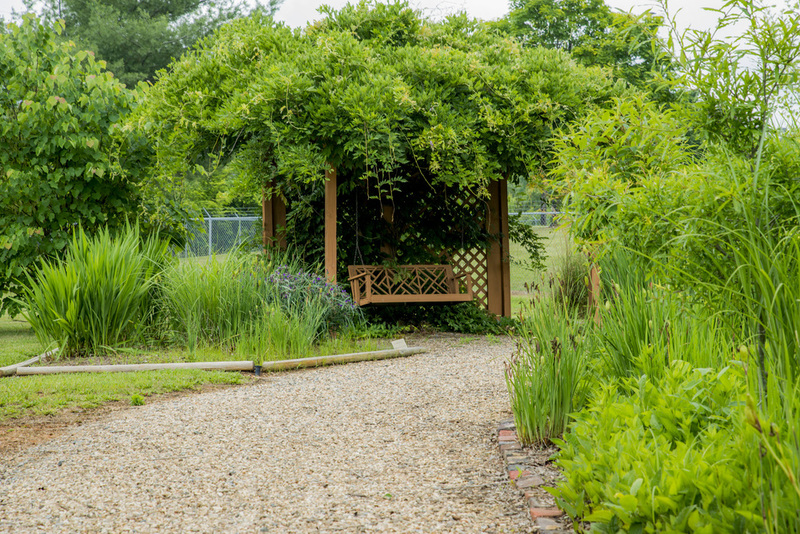 Stroll the pea gravel paths and you'll find water features (a goldfish pond and fountain), a pergola, a gazebo, a swing, plantings and dozens of trees, each identified by its botanical and common names. During the Victorian Era, gardening became popular among the middle and upper classes due to the increased amount of leisure time. 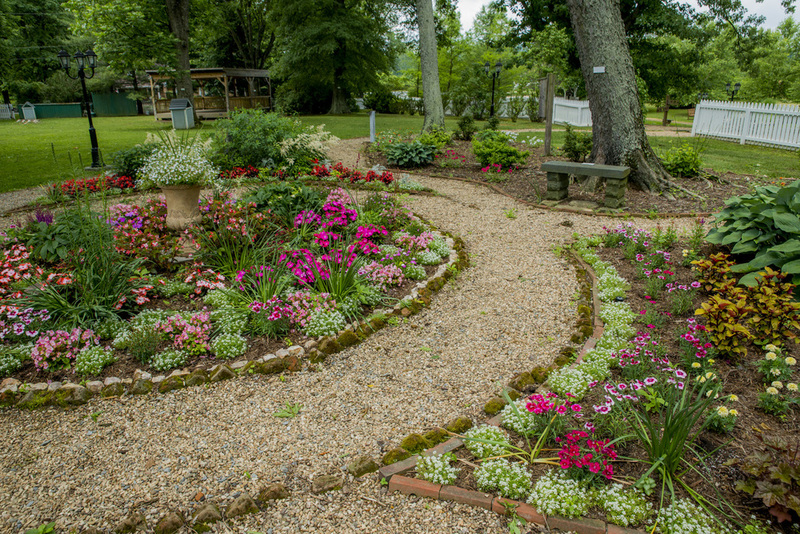 The garden was intended to be an outdoor parlor, aimed at a graceful combination of lawn, trees, shrubs, flowers, vines, fencing, ornaments and seating. The brick circles visible in the Victorian Garden were laid by 1880. These bricks were made on the property and have not been moved from their original placement. 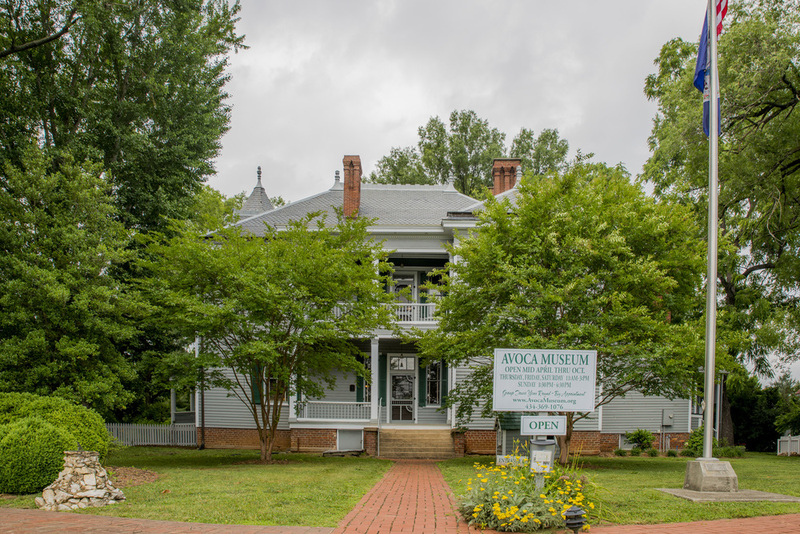 Avoca Museum is open to the public on Thursdays through Sundays, mid-April through October. Thursday through Saturday, the house is open from 11-3. The house is open on Sundays from 1:30-4:30. PLEASE NOTE: The house and grounds are closed on days of community and private events. Please check the schedule found on the home page for a listing of closures due to an event. The house is open for tours during the late fall and winter months on an appointment-only basis. Call (434) 369-1076 for an appointment.